Erik Jackson ran cold water over his sore, blistered hands when he came home late from Rogers High School on Thursday. The freshman’s school bus driver wouldn’t let him on the bus with his mother’s portable sewing machine. So Erik carried the 22-pound case 2.5 miles to his home on the 700 block of East Holyoke Avenue. He carried it by its hard plastic handle. Erik’s sister, Elizabeth, a sophomore at Rogers, had taken the sewing machine to school to help make costumes for her theater arts class. Elizabeth had carried the machine to school three times before on the same bus with the same driver, she said. On Thursday, she asked her brother to take it home for her because she had to stay late. Erik said Friday that when the driver told him “you’re not bringing that on here,” he could have left the machine in the school office, but his bus would have left without him anyway. Besides, he said, he wanted to bring his mother’s machine back. “The bus driver told me he got written up before for letting a large object on board,” Erik said. When Erik’s father, Len Jackson, saw his boy after school, he knew something was wrong. Erik has Type I diabetes, and the stress of the walk home carrying the uncomfortable weight caused his blood sugar to soar. “We managed to get insulin into him and considered taking him to the ER, but everything managed to settle down within an hour of his arriving home,” Jackson wrote Spokane Public Schools Superintendent Nancy Stowell. On Friday, Jackson said he heard back from Stowell, who told him the matter was under investigation. 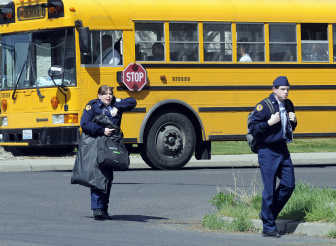 Spokane Public Schools spokeswoman Terren Roloff said the district confirmed with First Student Inc., the bus company with whom the district contracts, that the sewing machine was not allowed on board for safety reasons. Generally, she said, items are not allowed on buses if they cannot fit under the seat. Items such as band instruments are stowed in luggage compartments or strapped down in the cabin. “We do rely on our drivers to make that judgment call, because it’s all about the safety of the students on the bus,” Roloff said.